For motorsport enthusiasts, the debate about purchasing a Toy Hauler vs a Travel trailer rages on. They both have their advantages and disadvantages. So how do you decide which is best for you? It’s harder than ever to decide since the floor plans for Toy Haulers and Travel Trailers offer so many amenities now. So, we came up with a list of differences to consider before making a buying decision. A resolution to the issue of toy hauler vs travel trailer is this: it depends how much your vehicle can tow. Toy Haulers may be heavier than travel trailers and require a towing vehicle with more tongue weight and towing capacity. If you are planning to buy a new truck then this may not be an issue for you. But if you are planning to buy a new travel trailer or toy hauler and also a new truck to pull it, then it could be a deal breaker. What’s the Difference Between a Toy Hauler and A Travel Trailer? The biggest differences between travel trailers and toy haulers used to be weight and interior space. Toy Haulers are built on a sturdier frame and therefore can be much heavier than travel trailers. They also have a garage area which can take away from the interior space of the trailer. Some new toy hauler models are much lighter because they are built with aluminum. And they have fold away couches and a table that can be used to expand the living space into the garage area. Travel trailers have many luxurious features available for comfortable living conditions such as a big screen TV, fireplace, bunkhouse, full-size refrigerator, and the list goes on. All of this adds up to making the decision even harder for many purchasers. So, let’s look at our list of differences and evaluate them one by one. Garage space in a toy hauler is generally anywhere from 8 to 13 feet long with a rear or side ramp to get your motorsport vehicles on board. But garages have come a long way. Now, manufacturers have begun to make the garage multifunctional. Garages can now become a screened in covered deck, dining area, family room or sleeping area. By allowing the garage to be used in so many ways it expands the living space quite a bit. The downside to all of this is with the garage being open to the rest of the trailer gas and oil smells can spread throughout the trailer. But there are also options to have a closed off garage to prevent this from happening. Even if the garage is closed off you could still use it as a deck or patio. Garages now have the option to double as a covered deck under roof and the ramp can open to create an outdoor deck complete with deck rails. There are also screening options available to keep the bugs out. I have read many comments in RV Forums that the water tanks are larger in toy haulers than they are in travel trailers. I have not found this to be the case. Every manufacturer installs different size tanks on their models and toy haulers and travel trailer tank sizes look to be the same to me. Maybe some folks have 5th wheel toy haulers and they have larger holding tanks. Since toy haulers are built on a heavier frame they can withstand going off-road better than travel trailers. Not only do toy haulers have a stronger frame but they also have stronger axels and suspensions too. Obviously, it depends on the towing ability of your truck, the weight of the toy hauler and the terrain, as well. Some toy haulers are much heavier than their travel trailer counterparts. And, by expanding living space with slideouts and interior upgrades they are heavier yet. So, make sure you understand the towing capacity of your truck when compared to the weight of your fully loaded toy hauler. While toy haulers typically weigh more than travel trailers, hitch weight and carrying capacity are also factors to consider. Toy Haulers are designed to carry much more weight and usually have a heavier hitch weight too. However, there are some newer models with all aluminum frame and body construction such as ATC Toy Haulers that are very light and extremely strong. There is more interior storage space in a travel trailer since the floor plans include more closets per foot than toy haulers. However, toy haulers have garage storage space which can be used for motorized vehicles, bicycles, kayaks, coolers, chairs, and whatever else you can fit. Toy haulers can cost $20,000 to $80,000 or more, depending on size and amenities, which can range from very basic to quite comfortable. They also tend to be less expensive than fifth-wheel models, which are typically larger and more luxurious. A new travel trailer can cost between $8,000 to $65,000 but average between $15,000 to $30,000 depending on size, weight, floor plan, construction methods, materials, and amenities. Travel trailers range in size from 14 to 40 feet and so do toy haulers, although squeezing into a 14′ toy hauler would be tough. But typically they are comparable in length. Gas mileage will all depend on how heavy the total weight of your trailer is. Quite simply, the heavier the load the lower the gas mileage. So if you travel many miles a year then gas mileage may be important. In this case, a new lighter trailer would definitely be better for gas mileage but it will cost you more than an older heavier model. Interior features offered in both travel trailers and toy haulers have both come a long way. Travel trailers now have interior features that rival 5th wheels and larger RVs. You can now buy travel trailers with a fireplace, multiple bedrooms, two bathrooms, a bunkhouse, outdoor kitchen, outdoor recreation area, outdoor deck or elevated patio. The number of features available on travel trailers is amazing. And the same is true for toy haulers. Even though the living space is smaller toy haulers are made with upgraded interior and exterior features to maximize the space. Even the garage floors look like interior floors in some cases to enhance the usability of that area as a part of the overall living space. Obviously, you can haul an ATV, snowmobile or dirt bikes in your toy hauler. But what options do you have if you opt for a travel trailer? Well, if the bed of your pickup truck is big enough and can handle the extra weight, you can load your motorsport vehicles into the bed of your pickup truck. Maybe not a perfect solution but you can haul your toys and have more living space in your travel trailer too. Travel trailers and toy haulers do not typically come with built-in generators. However, some manufacturers now include an option to add a built-in generator. The generator is typically installed between the A-frame at the front of the trailer. Both travel trailers and toy haulers can have slide outs. Clearly, these add even more weight to either type of trailer. But they add a lot of additional space and even allow for a king-sized bed in some floor plans. Most toy haulers have one bathroom while larger travel trailers are able to accommodate more than one since they are roomier inside. If you have a large family or the girls want their own bathroom, a travel trailer can be a great choice. I have not seen a toy hauler with a bunkhouse. I have seen them with folding beds on the garage wall but not an actual bunkhouse unless you go up to a 5th wheel size toy hauler. Outdoor kitchens are available on toy haulers and travel trailers. They are a great option because most folks are outside anyway and an outdoor kitchen makes food prep easy and convenient. Both toy haulers and travel trailers have a multitude of floor plans to choose from. The advantage of a travel trailer is more interior living space for bedrooms, bathrooms and a family room. But toy haulers have come a long way in using all of the available space in the living area, garage area, and even the ramp to create as much living space as possible. The brakes that are installed on travel trailers and toy haulers can be different and they are based on the overall weight of the trailer. You should consider talking to a professional regarding electric brakes to your trailer if you haul an especially heavy load. 1. Should I Consider a 5th Wheel Toy Hauler too? If you want a luxurious RV and you want to haul your toys too then you should absolutely consider a 5th wheel toy hauler. Since 5th wheels are so large you will have a large variety of floor plans that include a garage and amazing interior features to choose from. You will also be able to have a closed off garage without sacrificing living space. 2. Should I Rent Before I Buy? Renting before you buy can, in this case, have a huge impact on your purchasing decision. The advantages and disadvantages of both travel trailers and toy haulers cancel each other out making the decision to choose one over the other extremely difficult. I would strongly recommend renting both types, unless you have experience with one, before making a purchase. It could save you a lot of money! Outdoorsy is a great place to find a wide variety of rentals in your area. As you can see, there is a lot to consider when deciding between a toy hauler and a travel trailer. There is no clear-cut answer for which one to buy. It all depends on what your needs are and how much your vehicle can tow. Although our list of items to consider doesn’t address every possible scenario, it should give you a good starting point in making an informed decision. 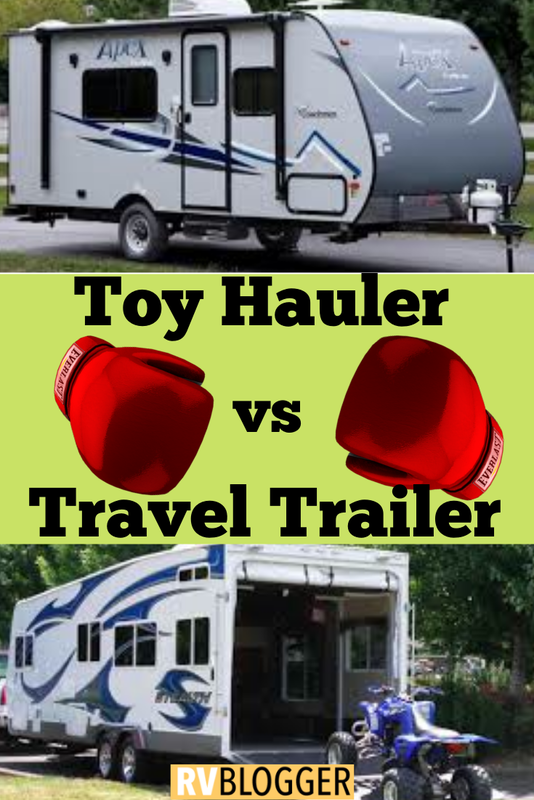 Do you have a tip or comment you would like to share about a toy hauler vs a travel trailer? Please share your comments or any questions below. Thanks for reading through this article and if you would like to contact us directly please feel free to go to our Contact Page to send us an email.